Simpurity™ silver alginate dressings are made of natural fibers derived from seaweed through a series of special processes. It is designed to be fast acting and highly absorbent. The dressing absorbs exudates and forms a gel-like covering over the wound, maintaining a moist environment for wound healing. The gel-like surface also keeps the dressing from adhering to the wound so it promotes painless removal. 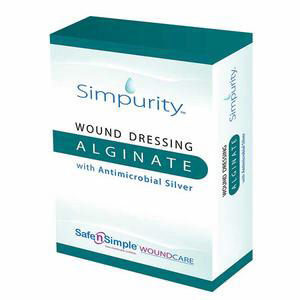 Simpurity™ silver alginate dressing can inhibit bacteria growing in the wound bed and reduce infection. Effective concentration of silver particles to reduce bio burden. Conforms to wound contours with gel forming property.